The Company Profile area is where administrators can update the company information within ESP. Administrators can update the company demographics; the required fields are Company Name, Email, and Phone number. Including a website is optional. 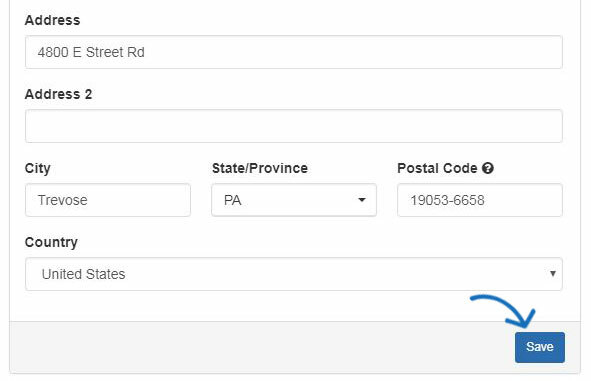 If you have a third party ordering system, you can enter the name of it in the Third Party System Name field. This is a required field, but will automatically have the name for the ESP Orders system provided, meaning if you use ESP Orders, you're good to go. You can also enter your company's address here including the city, state, postal code and country. 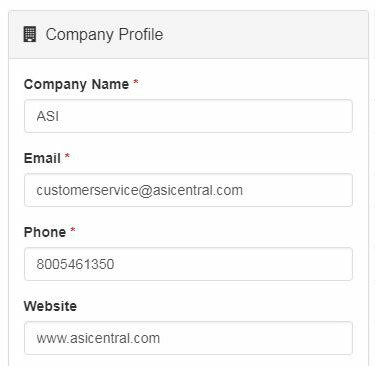 Default Salesperson: Select to have either the order creator (user who creates the order for any customer, existing or new) or customer record owner (user who owns the customer account in CRM) set as the default salesperson when a new order is created. Order Payments: Check the "Do not allow user to request or enter payment" option if you do not want users to perform these actions. Order Contact: An orders contact can be important be cause it lets the supplier know exactly who to contact when necessary. On customer-facing documents, such as the purchase order, the order contact will be visible towards the top of the document. 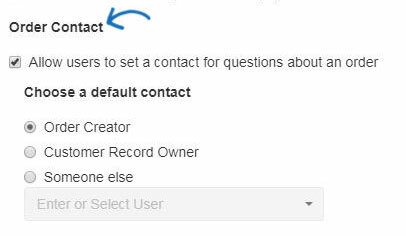 Select from the available options to set a default order contact. It is important to note that even if a default order contact is established, this information can be changed on the fly during the order creation process.